The Shops at Montebello is gearing up for Black Friday shoppers by offering great promotions! 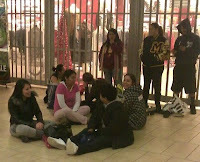 Mall entrances open at 10pm, stores open at midnight! Promotions offered on Friday, November 23, 2012 only unless otherwise noted. Spend $200 at the Shops at Montebello and receive 4 tickets to your choice of the Aquarium of the Pacific ($103 value), Universal Studios ($320 value), or Six Flags Magic Mountain ($180 value). Bring receipts to the Guest Services desk at Center Court for redemption. Promotion valid 11/23-12/16 or while supplies last. Sorry, this promotion has been cancelled. It has been replaced with Friday Free Days. The first 500 people at Center Court will receive a Shops at Montebello travel mug! Enter for a chance to win prizes from mall retailers every hour from midnight-8am at Center Court. Live DJ entertainment, coffee and pastries at Center Court. Midnight-8am. Enter for a chance to win one of three 3 day/2 night Disneyland Resort vacations for a family of four, contest sponsored by with 92.3 FM. Take a load off at the Relaxation Station, midnight-2pm. Kids can have fun at a Kid's Zone where they can enjoy crafts, entertainment, and snacks. Open 2-6pm. Get three gifts wrapped for only a $5 donation at YMCA's gift wrapping station. Open 10am-5pm. Purchase a $50 Visa Gift Card at Guest Services and receive a Free Holiday Teddy Bear. Dollars for Scholars Bonus Points, earn quadruple points for your school of choice by logging receipts from midnight-6am and triple points 6am-10pm. Earn 1,000 points with the purchase of a Visa Gift Card at Guest Services. For more about Black Friday at the Shops at Montebello, visit Guest Services at Center Court or click here. 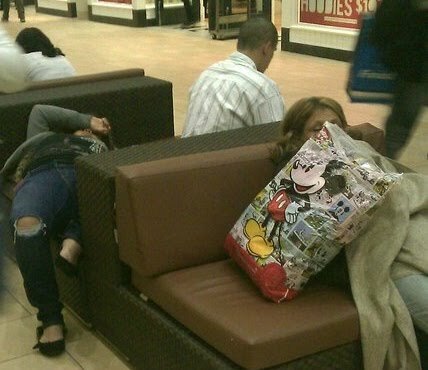 Waiting for JCPenney to open. 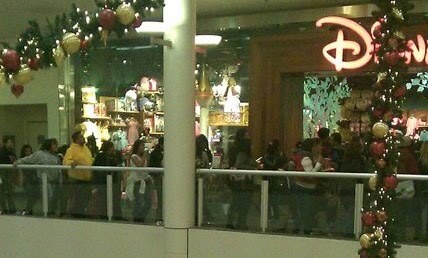 Line to enter the Disney Store. Can't get enough about Black Friday? Read my Top 10 Shopping Tips and my Notes from Black Friday 2011 which includes times people lined up at stores in Montebello. Happy Shopping!